Anatoly Perminov first proposed building the ship at a government meeting Wednesday but didn't explain its purpose. 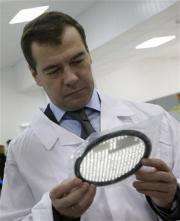 President Dmitry Medvedev backed the project and urged the government to find the money. In remarks posted Thursday on his agency's Web site, Perminov said the nuclear spaceship should be used for human flights to Mars and other planets. He said the project is challenging technologically, but could capitalize on the Soviet and Russian experience in the field. "The project is aimed at implementing large-scale space exploration programs, including a manned mission to Mars, interplanetary travel, the creation and operation of planetary outposts," Perminov's Web statement said. The ambitious plans contrast with Russia's slow progress on building a replacement to its mainstay spacecraft - the Soyuz. Despite its continuing reliance on the old technology, Russia stands to take a greater role in space exploration in the coming years. NASA's plan to retire its shuttle fleet next year will force the United States and other nations to rely on the Russian spacecraft to ferry their astronauts to and from the International Space Station until NASA's new manned ship becomes available. "It will be quite efficient for flight to Mars," he told The Associated Press on Thursday. He said Russia's experience in building nuclear-powered satellites would also help develop the new spaceship. "It will require a significantly more powerful nuclear reactor, but the task is quite realistic," Lisov said. The only planetary mission currently considered by Russia is a plan to send a probe to one of Mars' twin moons, Phobos. It was set to launch this year, but was delayed. Excellent news thats just what we need. I heard that the U.S Ad Astra Rocket Compagny with there "plasma rocket engine" VASIMR reached the 200Kw limit. Thats just enough to travel to Mars in 39 days! Nasa will use this propulsion technology in 2012-2013. So Russia can not left behind. I was just wondering: why don't they have this universal space station/science lab/etc. and each country can contribute to it (so it's planning a manned mission to Mars -- all countries donate some money therefore the burden on just one country is lightened) and then everyone who participates gets credit for first mission to Mars instead of us fighting over the spot (like the Space Race during the cold war). So instead of "USA went to Mars" it's "The Earth made it to Mars" O.o ...maybe? go russia! This news comes just as I put a youtube of the sputnik 1(and some succeeding sputnik flights involving dogs!) on my blog! So, this is kindof ironic and cool at the same time!
. . . go russia! Lets have a red flag on the red planet first! Hopefully, you guys/gals settle there as well! Tap those infinit resources without destroying living ecosystems(not likely on mars or various asteroids); and free energy! whew hew! Somebody clearly is thinking better than others here! And it's those scientific russians! Cooperation and coordination should really be the way ahead as demonstrated at CERN. It is so wasteful of resources to have various nations all expending resources to achieve the same end. The present US administration is against space flight and space science so I hope Russia does this and sparks another space race. The west and the USA in particular needs a kick in the pants. technology which is recognised by AIAA. Search for "Advanced Linear Electron Beam Phased Propulsion"
Are you saying...that they should be sued for making one??? (if so...what a typically American thing to say!) I for one applaud them for overcoming great obstacles, and wish them nothing but success! They were on the moon long before the U.S. (robotically-speaking of course) but never got their just recognition. Someone should forward this to Obama, but I doubt he would take it seriously. Would be ironic if Russia with it's languishing economy leap-frogged the US in space flight with a cheap Nuclear rocket. Although the problem with a Nuclear electric spaceship like Medvedev proposes is that you have to get it into space. If they wanted to use a Nuclear rocket to get it into space it would break the nuclear test ban treaty they signed. Which is also the reason the US doesn't already have nuclear rockets. Launch from earth is always going to be powered by conventional rockets. No nuclear propulsion system can overcome earth's gravity, just yet. Once in-orbit, you can break away from it and head towards Mars by using this nuclear powered thing. The cosmic radiation problem still needs to be overcome, during the journey. How does a nuclear engine propel a spaceship? The reaction products would not be enough momentum in a vector course. We can put this reactor on the ISS. Then we can attach a VASIMR engine to the ISS, powered by this reactor. Then, we can send the whole station to mars orbit - we could get there in 3.9 days with this technology! I don't believe we can get to mars in 39 days, it seems to good to be true. I think it would be strategic to pour everything into space elevator development, then you have a work horse to build the ship (amongst many other things) in space with a nuclear engine, both should be international co-operative efforts. If the nuclear engine is transported to orbit in a chemical rocket and bolted on to a ship there, I see no Chernobyl redeux, except in the minds of sissies! How much energy does the reactor, (which can be assembled in space from different launch vehicles delivering the components separately), need to produce to power an EM field generator to shield the ship during its voyage(s)? Would just one reactor be a good idea - shouldn't they build two for fault tolerence? If Russia is really going for it, will they accept help from other governments, such as China, India and Europe, to build a large reusable craft? Yes we must have two ships for the fault tolerance. We can have a Russian one with a Vladimr engine and an American one with a Vasimr engine. They could then get to Mars in under 3.9 days. You guys are amazing. Clearly, these comments are from an international crowd. First, kudos to the Russians playing to their strengths by pursuing a technology they already have a lead in of some sort. However, I'm pretty sure that once the US decides it needs to do this, they will throw an enormous amount of resources toward it. Better yet, it will probably be a private company who unlocks a cheaper/faster way to make it happen. Gotta run now. I was 10 when I saw the full nuclear (magneto-ion) project in the Kiev Planetarium. I am 51 now. Still talking and issuing directives. Get together and be serious! The estimates either assume that almost all work is done or someone can't count the money. The RD0410 Russian nuclear rocket engine uses liquid hydrogen for propellant, the reactor which weighs at 2 tons has a 196 MWatt power output and the thrust is around 35 kilo newtons, around the same thrust as a jet engine. In this configuration it can burn for about 60 minutes. For comparison, VASIMR (last I checked) has a thrust rating of more than 300 kilo newtons. That's a whole lot more thrust. Now, the Russians do make good nuclear reactors. A 200 MWatt reactor is needed to power the VASIMR engine. So it makes perfect sense to combine the two. I also believe that with enough funding the Russians can make their own version of the VASIMR, it is not a new concept. They would need to pull some new tech out of their rear, and I'm sure it's possible with enough funding, I just don't think they are going to actually get funded, which is quite sad. Russian mentality = "don't fix it till it breaks", that's why they still fly in the Soyuz, simply because it still works for them. has a thrust of more than FIVE newtons, not 300 kilonewtons. Specific impulse is around 6000 seconds. burn time was 20 hours. See the trend? Thrust is inversely proportional to efficiency. Find that inflection point on that curve, and apply it to Mars. to talk about it now. Burn time time of a NERVA engine is 20 minutes due to fast degradation of the active zone of this high power engine. The nuclear reactor of RD0410 is still working. All developments, including the Russian one, are only research stage devices. VASIMR it is a project on a plasma engine, i.e. it is different from NERVA and RD0410. It requires a nuclear power source. The most powerful ones was Russian space-tested TOPAZ (http://www.redsta...ear.htm) bought by the USA in 90s. It has the electric power 150 kW. Space flights require 5-15 Mw, minimum. The CrossFire Fusor is unbeatable in terms of performance. This nuclear fusion reactor could provide an Isp of over 1 million seconds. "NASA's plan to retire its shuttle fleet next year will force the United States and other nations to rely on the Russian spacecraft to ferry their astronauts to and from the International Space Station until NASA's new manned ship becomes available." This ignores the existence of SpaceX. Do SpaceX use VASECTMR engines? I agree - going to Mars in 3.9 days because of a 1KW VASIMR engine would reveal the 21st century's true world leader. So much hype over space exploration these days...From what I gather, this space chief of theirs is just making a few suggestions, throwing in some buzzwords, some numbers etc. I don't see any actual solutions or designs. I don't know the guy, he may very well be a very smart, well-intentioned fellow, but he's asking the government of a country that has an average life expectancy of 50-something years, more alcohol related deaths than anywhere on the planet, serious corruption problems, a very weak economy(for a country with massive resources), has recently been involved in a territorial war and generally isn't doing too well domestically, to spend 400 mil. euros(seriously? is there a discount shop I'm not aware of?) on speculative technologies with little short to mid-term gain. Seriously, why the bloody hell does everyone think that getting to Mars will solve all of Earth's problems? Let's prove we can sustain ourselves on one planet before we start f*cking up outer space. kasen, you beat me to it... $600M? If he can get a manned mission to Mars on that budget, I vote we hire him for NASA.